To mark 2018 International Women’s Day Socialist Action is republishing this article from 2017 on how women led the February 2017 Russian Revolution. The first Russian Revolution of 1917 – known in all the historical literature as the February Revolution – actually began on International Women’s Day March 8, which under the old style Russian calendar falls in February. This revolution was led by women. The widespread claim made at the time and repeated since is that the February Revolution was a spontaneous uprising. This assertion is used in contrast to the October revolution, which is widely dismissed by its enemies as a conspiracy or putsch led by Lenin or Trotsky. These claims are wrong in both instances. 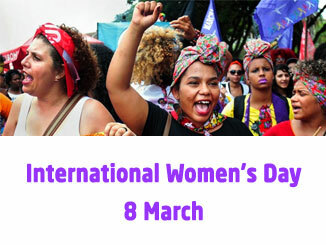 Revolutions require leadership, and the women organising the strikes, protests and mobilisations for International Women’s Day were central to the leadership of February. Some had come into contact with the ideas of the Bolsheviks and other revolutionaries before the war, some had participated in the 1905 Revolution, others had been imbued with revolutionary ideas as the war dragged on and the economic crisis deepened. Russia had been at war since August 1914 and was close to the point of moral, physical and economic exhaustion. That army was being frozen, starved or slaughtered at the front without any realistic prospect of victory. Simply avoiding defeat would require further enormous sacrifices and privations. The populations of the cities were also on rations, and the first blow against the Tsarist regime was delivered by the workers’ strike at Putilov factory, the largest in Russia on the day before International Women’s Day. Bread riots had erupted in Petrograd and elsewhere as the regime announced a further cut in the bread ration. 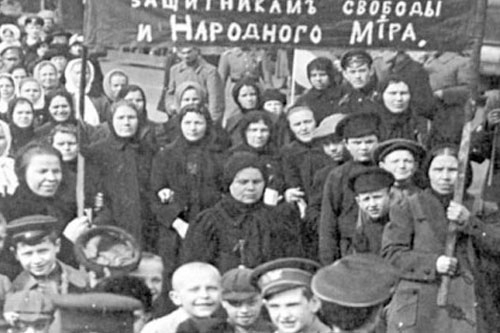 Women marched to bring out other workers and one estimate was that up to 50,000 were involved in Petrograd alone. The strikes, marches and mass meetings turned into a generalised protest and then uprising against the rationing, against the slaughter at the front, and above all for an end to the hated Tsarism. The Tsarists responded with ferocious state violence against all the protestors. Troops were ordered to disperse ‘illegal gatherings’ with horses, swords and guns. The women and the strikers refused to give way and the violence against them provoked the first open mutiny by the Petrograd soldiers. The Petrograd Soviet (workers’, soldiers’ and sailors’ council) was revived by the socialist parties and others, having grown up during the 1905 revolution, and began to take control of the functioning of the city. The more troops the Tsar’s generals sent against the revolutionary forces, the broader the revolt became and the greater the mutiny among the soldiers of the garrison and the sailors of the nearby fleet. Five days after International Women’s Day the Tsar had resigned and three days’ later all lackeys of the Tsar’s entourage had given up pretensions to the throne. The new situation left a Provisional Revolutionary Government as the titular legitimate authority. In effect the actual practical functions of government increasingly passed into the hands of the soviets, which mushroomed all over Russia and crucially included the peasantry in the countryside. This was to lead to a prolonged period of ‘dual power’ between the two authorities of the state, based on two different class alliances. This struggle between the two had many violent swings in either direction. It was only resolved by the October Revolution and the complete transfer of power to the soviets, that is the working class and the peasantry. In John Reed’s excellent book ‘Ten Days that Shook the World’ he shows that the victory of the October Revolution was only politically secured when the alliance of the workers with peasantry was sealed at the Peasants’ Congress. The presiding officer of the Peasants’ Congress was Maria Spiridonova, leader of the Left Social Revolutionaries, “the most loved and powerful woman in all Russia,” according to Reed. The agreement of the revolutionary peasants and the Petrograd Soviet led by the Bolshelviks established the revolutionary coalition government of the Left SRs and the Bolsheviks. Between the unnamed women of International Women’s day and the peasants’ leader there were innumerable other women, same famous, others nameless revolutionaries who played their part in two great Russian revolutions, and without whom neither would have been accomplished. On International Women’s Day and on the centenary of the Russian Revolution, we salute these heroic women who were vital to the success of those revolutions!